Charles F. Potts, chairman of the board of Indianapolis-based Heritage Construction and Materials, is the 2014 recipient of the George S. Bartlett Award. Potts, ARTBA’s 2008 chairman, received the award Sept. 30 at the association’s national convention. The Bartlett Award annually recognizes an individual who “has made an outstanding contribution to highway progress.” It is co-sponsored by ARTBA, the American Association of State Highway & Transportation Officials (AASHTO) and the Transportation Research Board (TRB) of the National Academies of Sciences, Engineering and Medicine. Potts’ career in the transportation construction industry spans more than 40 years. The Winston-Salem, North Carolina, native is a former CEO for Heritage Construction, former president of Ashland, Inc.’s highway construction contractor APAC, Inc., and held increasing positions of responsibility at the Florida Department of Transportation. Potts is a recognized expert in the field of hot mixed asphalt materials and construction. He has spent many years advocating the national need for a long-term transportation program that boosts federal investment in highways, bridges and transit systems and that includes a coordinated, long-term strategy to facilitate the safe and efficient movement of goods. 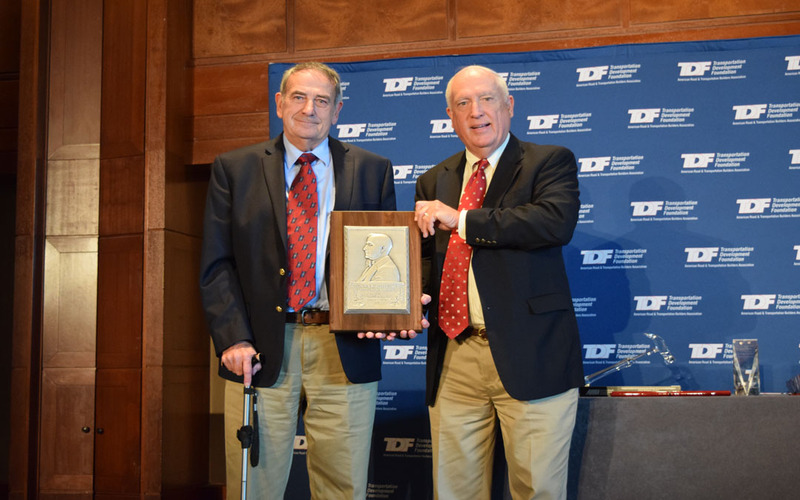 Established in 1931, the George S. Bartlett award is named for the man regarded as the greatest single influence on the use of concrete roads. During his career, Bartlett was lauded by contemporaries in the concrete and highway industry for his energetic and innovative promotion of concrete roads. In 1909, he established experimental stretches of concrete working with the Wayne County Road Commission in Michigan – the birthplace of modern road construction – and the University Portland Cement Company. The ARTBA convention continues here through Oct. 1.